cops ????? - Miata Turbo Forum - Boost cars, acquire cats. I got a set of 94-95 Toyota Camry coils for free and I wanted to put them on my Miata but the only problem is they only have 2 pins?????? The numbers on the coil is 90919-02214 what would I need to make these work. My car is a 99 Miata with a link piggy back. i don't think you can use those. every writeup on these has been on 2000+ coils, and they use three of the four pins, one for 5+, ground, and trigger. Yea but i think i read some thing some were saying you need to wire an igniter but not sure cant find were i saw it. Yup. These are just plain ole' coils, with no igniter circuitry. You'll need to wire 'em in just like 1.6 coils. You'll also need to scope the primary with an oscilloscope to determine the optimal dwell period for them. Yeah, you can probably use the stock igniter, but you'll still need an oscilloscope with a DC current probe if you want to determine the optimum dwell period for them in that configuration. An alternative would be to build your own igniter, using VB921s as per The Manual. If you do this, I'd use four VB921s and four 330 ohm resistors, with two each wired to SparkA and SparkB. That way, even though you're wasted spark, each coil gets its own driver and the primaries will charge faster. You could probably just run their recommended 3.5ms dwell and SparkOut = Inverted. I can draw you a schematic if you need one. 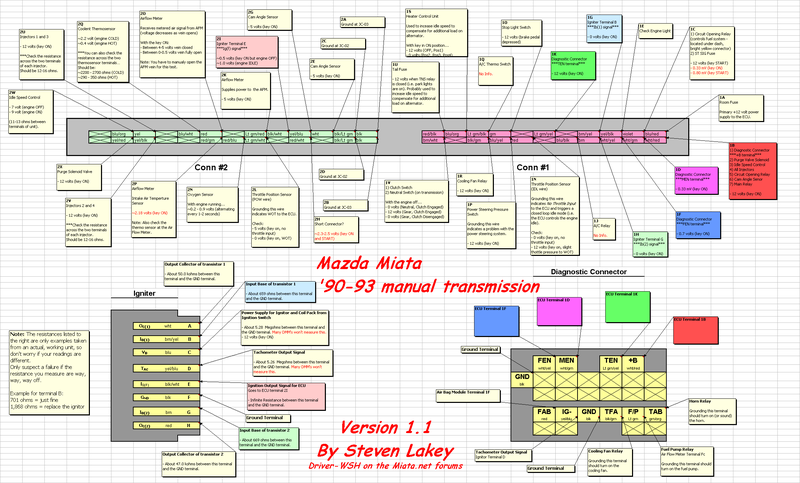 Last edited by 1990miata1.6; 03-04-2009 at 09:21 PM. Ok, forget what I said about building a VB921 circuit. Your plan with the 1.6 igniter is the easiest approach. 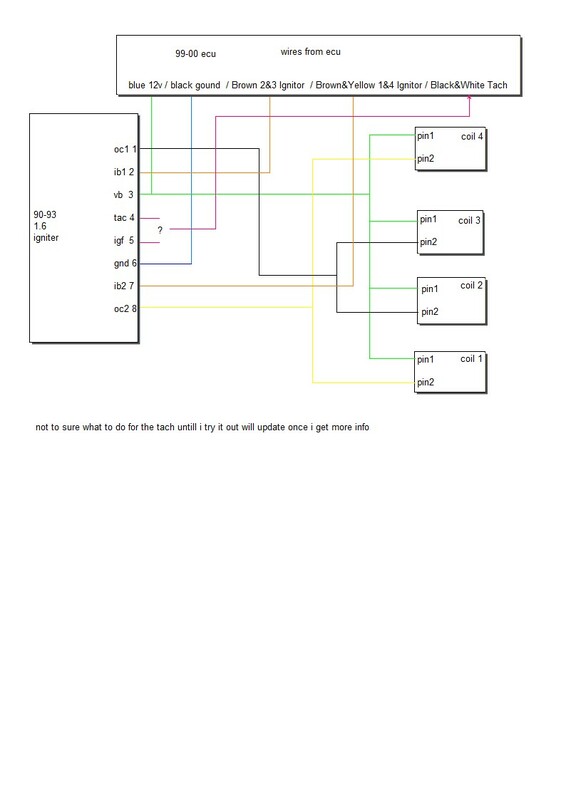 The diagram you posted looks good to me. Ignore the tach wire altogether. In the 1.6, the igniter provides the tach signal, but in your '99, the tach signal runs from the ECU direct to the dash, and never goes anywhere near the actual ignition system. You can just leave those pins disconnected. Uhm, you are joking, right? 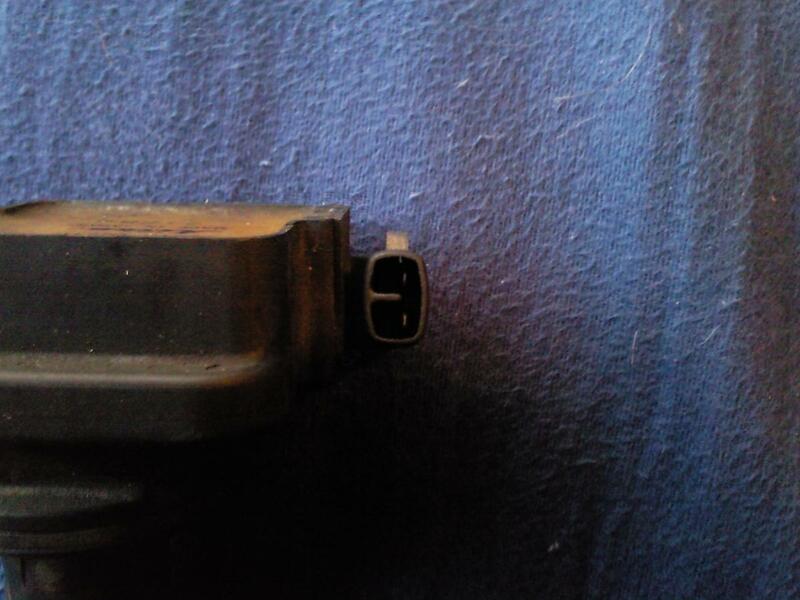 It's not so much the ECU or MAF sensor I'm thinking about here. well if its the motor or trany your thinking of all ready there. i am just about to finish my engine build i have a built 99 motor and im waiting for my 6 speed to come. Then you don't care about dwell and stock ECU can drive it just fine because all that matters are the trigger edges. Btw, I think those Toyota/Lexus dumb coils are popular (just like the 300M ones) among the CDI crowd at the AEM forums. 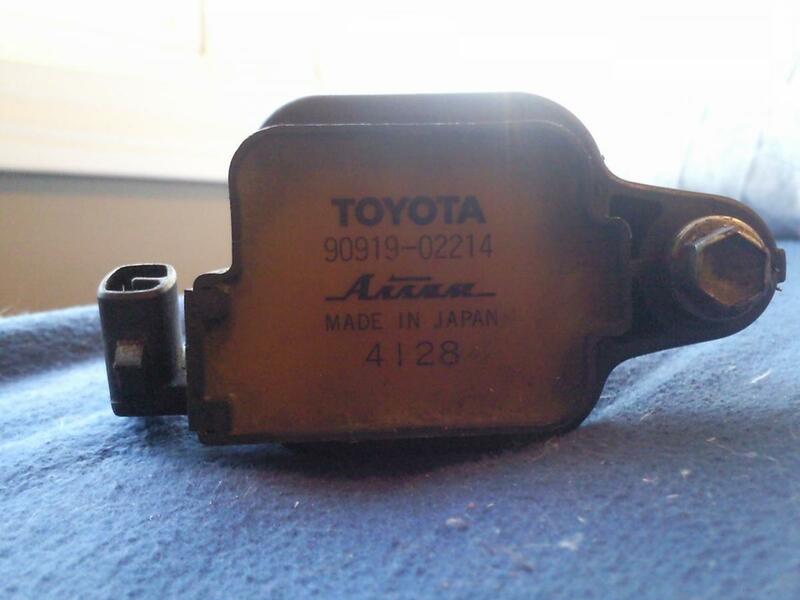 I remember people sourcing connectors for these and posting the Toyota/Lexus part numbers there. Never thought of that for now im going to use a 1.6 igniter. I got one for 25 bucks with the wiring harness.